Mr. Richard S. Tischner is the Director of the Court Services and Offender Supervision Agency for the District of Columbia (CSOSA). In this capacity, he leads the agency’s 850+ federal employees who uphold the agency’s mission of enhancing public safety, preventing crime, reducing recidivism, and supporting the fair administration of justice in close collaboration with the community. In July 2018, President Donald J. Trump nominated Mr. Tischner to serve as the third presidentially-appointed Director of CSOSA. 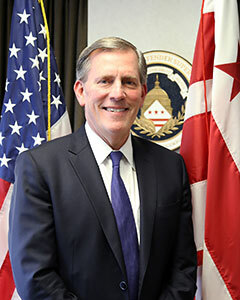 Mr. Tischner appeared before the Senate Committee on Homeland Security and Government Affairs in November 2018; and his nomination was confirmed by the Senate in January 2019. On February 11, 2019, Mr. Tischner was sworn into his six-year term in office by United States Attorney for the District of Columbia Jessie K. Liu. Mr. Tischner has been a public servant for more than 33 years. He has served as an attorney for the Federal Government of the United States at the Merit Systems Protection Board as well as the Federal Trade Commission. He has spent the last 30 years as an Assistant United States Attorney for the Department of Justice, most recently serving as the Chief of the Superior Court Division at the United States Attorney’s Office for the District of Columbia.